Im going to teach you to read drum notation.Its quite simple and easy.I prefere it over tabs.In this lesson theres a picture then underneath the picture theres the text to describe it. This is called the staff.Its what holds the notes.They can be above it,on it,or below it.The notes on the staff tell you what drum or cymbal to hit. The drum cleff shows that the peice of music is for drums.It is located on the first measure of a peice of music. A bar is the vertical line in between the measures.A measure is the space in between two bars. Now ill teach you how long each note lasts,how to count them,and more.Heres a Metronome for down load if you want to use it. This first note is called a whole note.It lasts four beats.It is counted 1,2,3,4.In 4/4 time it would take up a whole measure. The second notes are called half notes.They last two beats.They are counted 1,2,3,4.There are usually two of these in a measure. The third set of notes are called quarter notes.They last one beat each.They are counted 1,2,3,4.There are usually four of these in a measure. 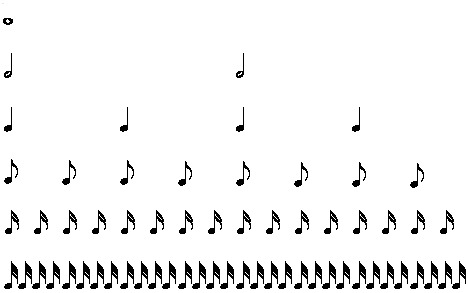 The fourth set of notes are called eighth notes.They last 1/2 a beat each.They are counted 1,&,2,&,3,&,4,&.There are usually eight of these in a measure. The fifth set of notes are called sixteenth notes.They last 1/4 a beat each.They are counted 1,e,&,a,2,e,&,a,3,e,&,a,4,e,&,a.There are usually sixteen of these in a measure. The last set of notes are called thirtysecond notes.They last 1/8 of a beat each.They are quite fast.They are to fast to count really.There are usually thirtytwo in a measure. The rests in the pictures are next to the note that lasts as long as they do.Like a quarter note and a quarter rest. This first repeat is a multi-measure repeat.It can have both things on it or just the one on the right.They are most commonly used in exercises.The one on the right is at the end usually.when only this repeat is used that means you have to go to the begining and play again.When both are used.You go to the second one then you go back to the first one and play till the end unless another kind of repeat is there. This repeat shows that you should go back and play the measure you just played.If it has a number over it.That means you need to repeat the measure in front that many times. This repeat is called a two-measure repeat.It means to play the last two measures again. This rest is a whole rest.It counts as four beats.In 4/4 time it would take up a whole measure. This is a half rest.It lasts up two beats.Two half rests make one whole rest. This is a quarter rest.It lasts one beat.In 4/4 time it would have four od them.There are two quarter rests in a half rest. An eighth rest lasts 1/2 a beat.There are two eighth rests in a quarter rest. This is a sixteenth rest.It lasts 1/4 a beat.There are two sixteenth rests in an eighth rest. This is a thirtysecond rest.It lasts 1/8 of a beat.There are two thirtysecond rests in a sixteenth rest. A triplet last one beat but it adds a third note to it.You play it slightly faster.There are different ways of counting them I'll tell you how to count a few.The first way is 1,la,lee,2,la,lee,3,la,lee,4,la,lee.That is eighth note triplets.Heres another 1,ah,dah,2,ah,dah,3,ah,dah,4,ah,dah.The first picture is eighth note triplet.Heres another way 1,trip,let,2,trip,let,3,trip,let,4,trip,let.When you count sixteenth note triplets you count them the same but instead of the next number say 1,la,lee,&,la,lee.You also play it faster.